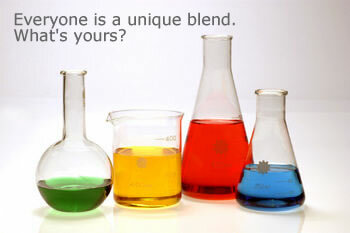 What is your unique personality blend? Did you know that you have a mixture of 4 major traits in your personality? Do you know your strengths? Try this short personality quiz to get an estimate of your strongest personality traits. This is NOT our full DISC personality test (assessment) - this is just a quiz. This quiz is only intended to estimate traits which may be prevalent in your personality style. We invite you to "experiment" with this free disc test to get an idea about your personality style. Before you start ... please keep in mind that there are no “right” or “wrong” answers in this quiz! You cannot pass or fail. This is not a test. This is just a quiz to help you learn. In fact, you can change your answers later if you want to. Simply make your selection according to how you see yourself. This is not about answering based on what you hope to become one day in the future. Neither is it about answering based on how you hope that others might see you. It is simply about how you see yourself. Your first inclination is probably your best response and the one you should select. 1. Choose either a "work environment" or a "home environment" to be the context of your answers. In other words, you will answer the questions either based on how you are at work or based on how you are at home. 2. Choose statements that best describes you for each of the 8 items below. 3. Fill in your name and email address for personalization of your Strongest Trait report. WORK - I will answer as if I am in my work environment. HOME - I will answer as if I am in my home environment. take time to consider my position before letting others know. respond readily and make my position known to others. be active and have many things to do. be settled and limit my attention to a few things . be comfortable when I can work without being regularly interrupted by others who just want to socialize. be comfortable when I can work for a while and still take regular breaks to visit and socialize. be comfortable with spending time in friendly conversation that is about people and relationships. be comfortable spending time in serious conversation that is about facts and information. look for solutions when others bring up problems that they are going through. find out how others are feeling when they bring up problems they are going through. be comfortable concentrating and working with detailed information all day long. be comfortable talking with many people and motivating others all day long. be comfortable listening patiently and assisting people all day long. be comfortable having to lead a big project that involves making many decisions all day long. Type in your name exactly as you would like it to appear in the report (no extra initials please). We will email you a link with some free, useful resources. We will not share your email address with anyone else. If you are looking for a DISC test online or learning about your strengths with a full personality assessment and a complete DISC profile report, then please visit our online store to see our complete suite of personality profile solutions. This free DISC assessment is only designed to give you an idea about your personality style. This is just the tip of the iceberg. We suggest you also try our free course on better relationships as a next step.